Death Knights, the « ex-servants » of Lich King are one of the easiest and fastest classes to level (and or solo). They can summon undead ghouls to fight for them and spread diseases to their enemies, all while using non-mana using heals. The fastest way to level a Death Knight (without downtime) is Blood and subspeccing a few talents into Unholy that increase your (and your pets) damage. Unholy has its own potential (especially when AoE grinding mobs), but is overall slower than Blood and lacks the self heal abilities. You will be able to solo most elites/tougher mobs/mob packs with ease. 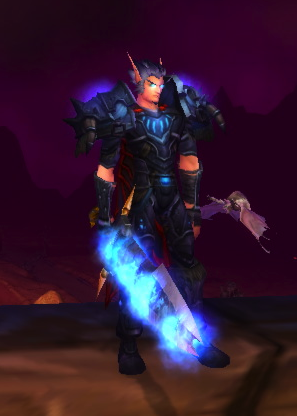 Blood Death Knights are considered one of the best solo class-specs. Always take the weapon with the best stats. -Open the fight with Death and Decoy (make sure all the target mobs are affected by it), then immediately use Icy Touch and Plague Strike on ONE mob (that will survive both of them*) and then quickly spread the two diseases with Pestilence. – Then continue like with « Single Target« , but continue using Pestilence to keep Frost Fever and Blood Plague refreshed. [EXTRA TIP:] If you know that the mob that you are going to use as a « spreader » won’t survive both Icy Touch and Plague Strike (such as in low level instances), use only one of them, and Pestilence right afterwards. Then use the other ability that you didn’t use yet on an other mob (preferrably the one with most hitpoints) and quickly use Pestilence. -Always keep Horn of Winter refreshed. -Put Mark of Blood on a mob if the healer needs help healing. Put it preferably on a target with as fast attacks as possible. -If you are not the tank and the tank dies (or can’t keep aggro because of something else), aggro* the mob(s) before they kill the healer(s). (You DO wear plate after all…) This is called « off-tanking« . -Always keep both, Blood Plague and Frost Fever on the target(s). -Remember to use Pestilence when against multiple enemies in order to dave you frost/unholy runes. Blood (+ Rune Tap). You should use Death Strike as often as possible. -Always keep Horn of Winter on. -Pretty much the same as with « Solo », but you have to move more and stay close* to the enemy. Go HERE for a more detailed Death Knight pvp guide (WoWWiki). -Two gathering professions, such as Mining, Skinning, Herbloring. Gathering professions make loads of money if you know where to sell your materials (Auction House). – Mining/Blacksmithing – Perfect for making your own gear. Blacksmithing gives both your rings two additional sockets. Later on, you can give Mining away and replace it with an other profession (such as Jewelcrafting). – Jewelcrafting/Blacksmithing – Only suggested if you have an other alt gathering the materials (Mining). Jewelcrafting gives you special « jewelcrafter only » gems and Blacksmithing gives you two additional gem sockets on both your rings. – Enchanting/Tailoring – Not very « Death Knight lore-friendly », but they make a good amount of money. ATTENTION! All the professions are good, but these are especially for Death Knights. Go HERE for a list of them (WoWWiki). Glyph of Dark Death (lv 55) – Increases the damage or healing done by your Death Coil by 15%. Glyph of Death Strike (lv 55) – Increases your Death Strike’s damage by 1% for every 1 runic power you currently have (up to a maximum of 25%). The runic power is NOT reduced by this effect. Glyph of Raise Dead (lv 55) – Your Raise Dead spell no longer requires a reagent. Glyph of Pestilence (lv 55) – Increases the radius of your Pestilence spell by 5 yards. Glyph of Horn of Winter (lv 55) – Increases the duration of your Horn of Winter ability by 1min. 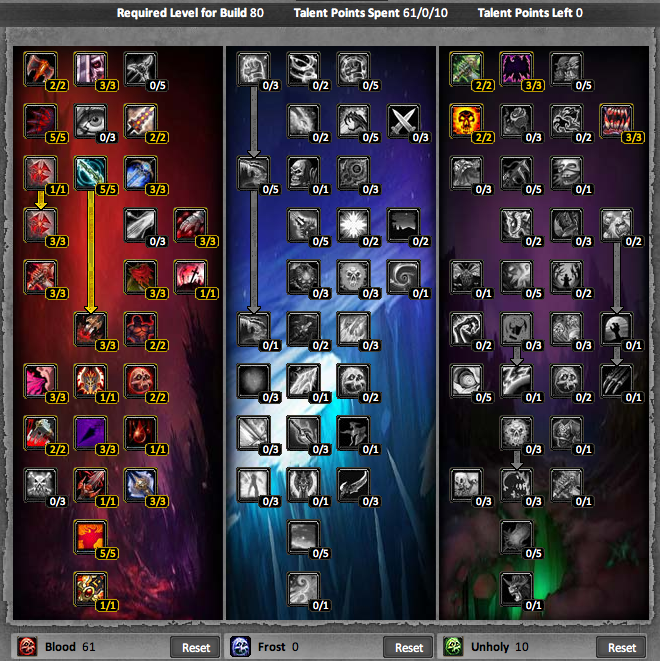 – Magic Runes – Magic Runes is a fresh way of displaying rune cooldowns with a set of bars. Its purpose is to either replace or be an addition to the normal Blizzard (or other Unit Frame) rune display. – ForteXorcist – ForteXorcist, originally a DoT (Damage over Time) tracker addon for only Warlocks , is nowadays one of the most popular and powerful Raiding AddOns that exist. Its main features include (but are not limited to) a spell timer, a cooldown timer, self & raid messages and warning sounds.